If you need a wedding or anniversary gift, or just want someone to know how special they are on Valentine’s Day or their birthday, this beautiful throw is the perfect choice. 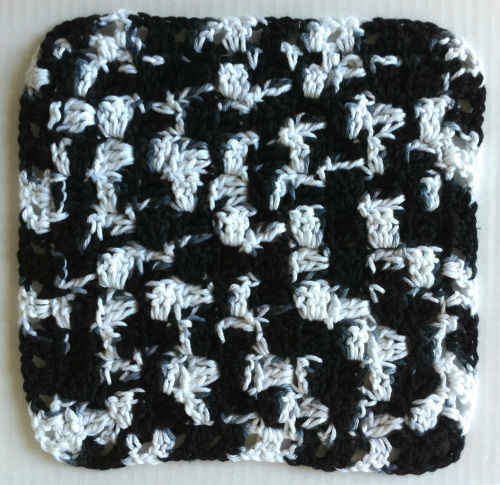 Four interesting crochet pattern stitches are used, including Popcorn Hearts. GAUGE: 14 sts = 4″ in single crochet using middle-size hook; Popcorn Pattern section measures about 5½” wide; Diamond Pattern section measures about 6″ wide; Popcorn Hearts section measures about 6″ wide. CHECK YOUR GAUGE. Use any size hook to obtain the gauge. Throw measures 41” wide and 55” long. Fptr = Front post treble crochet. [Yarn over] twice, insert hook from the front side of the work to back and to front again around the post of the indicated stitch on a previous row; yarn over and pull up a loop (4 loops on hook), [yarn over and draw through 2 loops] 3 times. Popcorn = Work 4 sc in indicated stitch or space, drop loop from hook, insert hook in first sc of the 4-sc group just made, return dropped loop to hook and draw through. Woven st = Yarn over, insert hook in indicated stitch or space, yarn over, pull up a loop (3 loops on hook) and draw this loop through one loop on hook (2 loops on hook), yarn over and draw through both loops on hook (one loop on hook), yarn over (2 loops on hook), insert hook in same stitch or space, yarn over, pull up a loop, and draw this loop through both loops on hook. 1. Throw is worked from one long side edge across to the other long side edge. 2. Four pattern stitches are used; Arrows, Popcorn, Diamonds, and Popcorn Hearts. 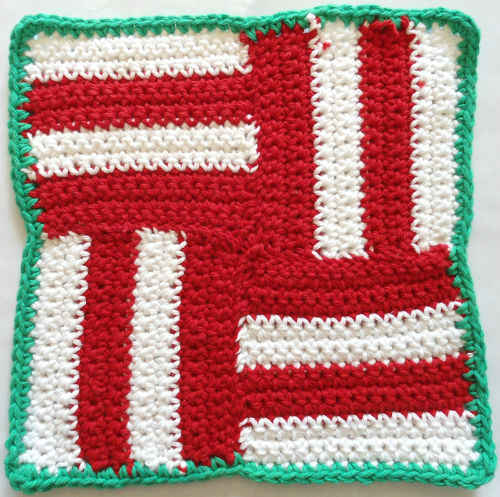 The pattern stitches are separated by Front Ridges. With middle-size hook, ch 183. Row 1: Sc in 2nd ch from hook and in each ch across, turn—182 sc. Row 2 (Right Side): Ch 1, working in front loops only, slip st in next sc and in each sc across, turn. Row 3: Ch 1, working in free loops of sts of previous row, sc in each sc across, turn. Row 4 (Right Side): Ch 3 (counts as first dc here and throughout), *skip next 3 sc, tr in next sc; working behind tr just made, dc in each of the 3 skipped sc; repeat from * across to last st, dc in last st, turn. Row 5: Ch 3, *skip next 3 dc, tr in next tr; working in front of tr just made, dc in each of 3 skipped dc; repeat from * across to last st, dc in last st, turn. Rows 6 and 7: Ch 1, sc in each st across, turn. Rows 8 and 9: Repeat Rows 2 and 3. Row 10 (Right Side): Ch 1, sc in first st, *ch 1, skip next st, Popcorn in next st, ch 1, skip next st, sc in next st; repeat from * across to last st, sc in last st, turn. Row 11: Ch 1, sc in first st, *ch 1, skip next st, sc in next ch-1 space; repeat from * across to last st, sc in last st, turn. Row 12: Ch 1, sc in first st, *ch 1, skip next st, sc in next ch-1 space, ch 1, skip next st, Popcorn in next ch-1 space; repeat from * across to last st, sc in last st, turn. Row 14: Ch 1, sc in first st, *ch 1, skip next st, Popcorn in next ch-1 space, ch 1, skip next st, sc in next ch-1 space; repeat from * across to last st, sc in last st, turn. Rows 15–22: Repeat Rows 11–14 twice. Rows 23 and 24: Repeat Rows 11 and 12. Row 25: Ch 1, sc in first st, work 2 sc in each ch-1 space across, sc in last st, turn. Rows 26–33: Repeat Rows 2–9. Rows 34 and 35: Ch 1, sc in each st across, turn. Notes: In the following rows, stitches are worked into the usual row (1 row below row being made) and around stitches 3 rows below. Unless otherwise stated, work and skip stitches in the usual row. Only work or skip stitches 3 rows below when instructed. Row 36 (Right Side): Ch 1, sc in first st, Fptr around 4th sc 3 rows below, skip next st (behind the Fptr), sc in next 4 sc, Fptr around next sc 3 rows below (next to the last Fptr worked), *skip next 4 sc 3 rows below, Fptr around next sc 3 rows below, skip next 2 sc (behind the 2 Fptr sts), sc in next 4 sc, Fptr around next sc 3 rows below; repeat from * across to last 2 sts, skip next st (behind the last Fptr), sc in last st, turn. Rows 37–39: Ch 1, sc in each st across, turn. Row 40: Ch 1, sc in first 3 sts, Fptr around 2nd sc 3 rows below (directly above Fptr of previous Fptr row), skip next 4 sc 3 rows below, Fptr around next sc 3 rows below, skip next 2 sts, *sc in next 4 sts, Fptr around next sc 3 rows below (next to the last Fptr worked), skip next 4 sc 3 rows below, Fptr around next sc 3 rows below, skip next 2 sts; repeat from * across to last 3 sts, sc in last 3 sts, turn. Row 41: Ch 1, sc in each st across, turn. Rows 42–57: Repeat Rows 34–41 twice. Rows 58–65: Repeat Rows 2–9. Rows 66–69: Ch 1, sc in each st across, turn. Note: If desired, work a tight ch-1 after completing a Popcorn, to close the Popcorn. The ch-1 is part of the Popcorn, do not count it as a separate st in the following rows. Row 70 (Right Side): Ch 1, sc in first 16 sts, Popcorn in next st, sc in next st, Popcorn in next st, *sc in next 18 sts, Popcorn in next st, sc in next st, Popcorn in next st; repeat from * across to last 16 sts, sc in last 16 sts, turn. Row 71: Ch 1, sc in each st across, turn. Row 72: Ch 1, sc in first 15 sts, [Popcorn in next st, sc in next st] twice, Popcorn in next st, *sc in next 16 sts, [Popcorn in next st, sc in next st] twice, Popcorn in next st; repeat from * across to last 15 sts, sc in last 15 sts, turn. Row 73: Ch 1, sc in each st across, turn. Row 74: Ch 1, *sc in next 14 sts, [Popcorn in next st, sc in next st] 3 times, Popcorn in next st; repeat from * across to last 14 sts, sc in last 14 sts, turn. Row 75: Ch 1, sc in each st across, turn. Row 76: Ch 1, sc in first 13 sts, [Popcorn in next st, sc in next st] 3 times, Popcorn in next st, *sc in next 14 sts, [Popcorn in next st, sc in next st] 3 times, Popcorn in next st; repeat from * across to last 15 sts, sc in last 15 sts, turn. Row 77: Ch 1, sc in each st across, turn. Row 78: Ch 1, sc in first 12 sts, [Popcorn in next st, sc in next st] 3 times, Popcorn in next st, *sc in next 14 sts, [Popcorn in next st, sc in next st] 3 times, Popcorn in next st; repeat from * across to last 16 sts, sc in last 16 sts, turn. Row 79: Ch 1, sc in each st across, turn. Row 80: Repeat Row 76. Row 81: Ch 1, sc in each st across, turn. Row 82: Repeat Row 74. Row 83: Ch 1, sc in each st across, turn. Row 84: Repeat Row 72. Row 85: Ch 1, sc in each st across, turn. Row 86: Repeat Row 70. Rows 87–91: Ch 1, sc in each st across, turn. Rows 92–131: Repeat Rows 26–65. Change to largest hook, and change to middle-size hook when instructed. Rows 132–155: Repeat Rows 10–33. Edging (Right Side): Ch 1, slip st in each st across, ch 1 (corner), work 140 sc evenly spaced across side edge, ch 1 (corner); working across opposite side of foundation chain, slip st in each st across, ch 1 (corner); work 140 sc evenly spaced across side edge, turn. Row 1 (Wrong Side): Ch 2, skip first st, Woven st in next st, *skip next st, Woven st in next st; repeat from * across to next corner ch-1, turn. Rows 2–6: Ch 2, working in spaces between Woven sts, Woven st in space between first and 2nd Woven sts, Woven st in each remaining space across, Woven st in turning ch-2 space, turn. Row 7 (Shells): Ch 1, working in spaces between Woven sts, *skip next space, 8 tr in next space (shell made), skip next space, sc in next space; repeat from * across. Fasten off. With Wrong Side facing, join yarn with slip st in corner to work across other short edge. Work Woven Stitch and shell Edging across remaining short edge. Fasten off. 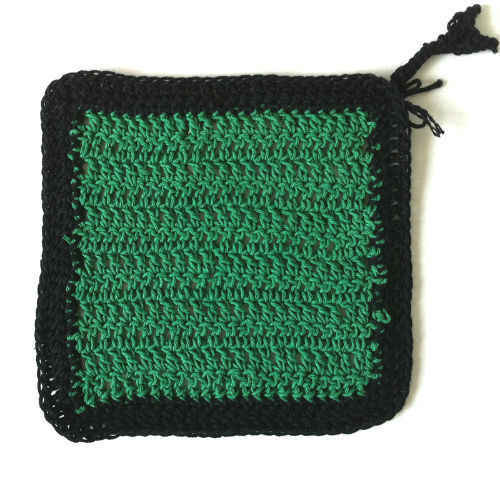 ABBREVIATIONS: ch = chain; dc = double crochet; sc = single crochet; st(s) = stitch(es); tr = treble crochet; * = repeat whatever follows the * as indicated; [ ] = work directions in brackets the number of times specified.